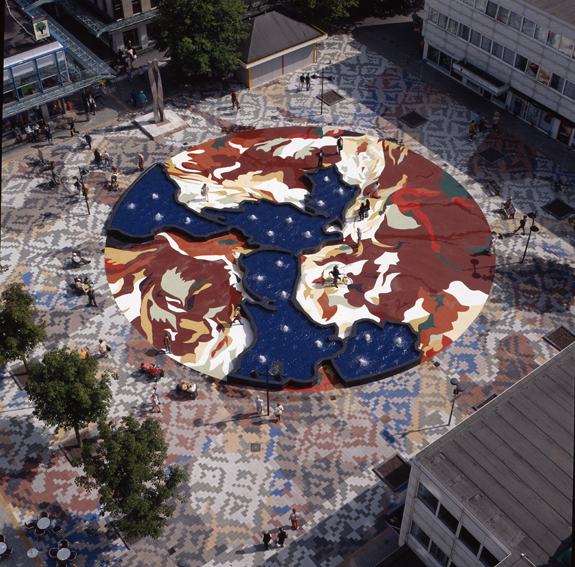 During the fall of 1995, Barbara was commissioned to create a sketch design for the huge renovation of the Buikslotermeerplein, in the north of Amsterdam. One of the challenging demands for the design was the inclusion of water reservoirs and fountains. For Barbara, this highly encouraged her enthusiasm for the project. She has always loved the floor as a working space, since it offers a great spectrum of perspective angles from which the composition can be seen. Besides, the distance of the viewer plays an important role when it comes to the experience of the square. Both these elements define Barbara’s ‘handwriting’ in a very strong way. The delicate balance between the moment when an image is recognizable, or falls apart in fragments of form and colour, has intrigued her from the start. Another important element in Barbara’s work is the ‘casual experience’. It is her ambition to implement her work in daily life, in order to make it ‘useful’. Turning the Buikslotermeerplein into a nice and enjoyable place therefore made the commission a great challenge. The square is used by people passing by as well as by inhabitants of the area. Therefore, the square is seen from close by (while walking on it) and from a distance (from the houses surrounding it). Barbara chose dynamic, organic motives drawn from nature. The shapes cover the full square and are mostly abstract. Themes such as light, movement, three-dimensionality and colour were very important for the final image. By combining these elements in a challenging way, Barbara managed to turn the cold and impersonal space into an accessible and ‘warm’ square. - The rose petal motive, which is recognizable from a distance but falls to abstraction while approaching it. The motive in the circle itself is based on a ceiling fresco by Rubens. This fresco was edited by the Paintbox computer into a new composition. During the second phase of design, the inclusion of water and fountains was added to the commission. Since the functional value of her work is of great importance for Barbara, this addition felt like the missing link to a complete artwork. Thoughts and ideas about water had crossed Barbara’s mind before, but she immediately designated them as non-realistic. Now that she got the possibility to make these ideas happen, it felt like a true gift. Since the commission became more extensive along the way, and architectonal elements were added as well, Barbara decided to involve architect Kees van Santen into the pocess. The result of this pleasant collaboration led to a plan in which Barbara’s creative ideas and qualities were enhanced by the technical input of the architect. The big blue surfaces, which were supposed to depict Rubens’ skies, were now transformed into huge ponds. A literal transformation from heaven to earth took place. The ponds have the erratic shapes of the figures with their deformed garments, heads and arms. When her daughter was little, Barbara realized how much the city lacked a possibility to play in the water, especially during the hot summer days. Day after day, she carried her child to the ponds of the Vondelpark and the Oosterpark, since those were the only save places for her to play in the water. This commission made her feel she could definitely contribute something to the city. Besides, the presence of water gives a lot of positive qualities to its environment: the effect of its’ soothing sound, the bright reflections of sunlight, the intimate atmosphere it recalls, the joy of watching other people. All these elements were taken in consideration during the designing process. The final result of the commission is a colourful, pleasant square, which is enjoyable for people passing by, as well as for its inhabitants.